The Food and Agricultural Organization of the United Nations (FAO) will provide significant assistance to enhance food security, nutrition and farming activities in the East. This follows the FAO approving the 'Enhancing Food Security and Nutrition among the farm families in Eastern Sri Lanka' project funded by a donation of European Commission, for the value of Euro 5,127,252(US $ 7.3 million). This project will directly assist 20,000 farming families, enabling them to restart the production of rice, other field crops, vegetables, fruits and poultry. The project's objective is to restore and enhance agricultural production to ensure food security and improve nutrition for the returning or recently resettled farming activities in the Trincomalee and Battticaloa districts. Activities are also expected to indirectly benefit a further 100,000 rural families by increasing the availability of locally produced food. The beneficiary families will receive assistance in clearing their former farmland, preparing paddy fields, and rehabilitating irrigation tanks and small scale irrigation channels. They will be provided with improved seed varieties, fertilizers and agricultural tools, to enhance food security and promote income generating opportunities. FAO has provided technical and financial assistance worth of US $ 25,551,420 to Sri Lanka during the last two years. COLOMBO (AFP) – Sri Lanka's military rejected on Wednesday a video clip broadcast in Britain allegedly showing its troops executing prisoners during the final stages of its battle against Tamil Tiger rebels. Sri Lankan army spokesman Brigadier Udaya Nanayakkara said the footage aired by Channel 4 in Britain was a fabrication to discredit security forces who defeated Tamil separatists in mid-May. "This video has been made to discredit the armed forces," Nanayakkara said. "This was said to have been filmed at a time when the Tigers too were operating dressed in (Sri Lankan) military uniforms." The disturbing footage shows a man dressed in army uniform shooting a naked, bound and blindfolded man in the back of the head, while the bodies of eight others can be seen nearby in a muddy field. A 10th man was also shot in the same way towards the end of the video with men in the background gloating over the killings. Srilankan Engineering recently carried out two major projects for Airblue, the privately owned Pakistani airline that has been one of its long-time customers. The back to back projects, the first a C-check on an Airbus A321 which was completed in 7 days, and the second a landing gear change on an A320 that took just 3 days were carried out at the BIA hangar complex recently. Srilankan Engineering now has an excellent reputation among airlines in the region. Through our superior service, we cultivate long term relationships with our customers, and we are at present in discussions with yet another airline, this time from South Asia, to carry out their maintenance work, said Head of Engineering, D. A. G. Jayasuriya. Srilankan Engineering has been positioning itself as a Maintenance Repair Organization (MRO) for airlines in the Asian region, and is now an independent revenue/cost center in Srilankan Airlines. Srilankan Engineering possesses the prestigious industry standard EASA 145 from the European Aviation Safety Agency, in recognition of its commitment to the highest standards of professionalism in aircraft maintenance, as well as recognition by several aviation authorities in Asia. Aug. 24 (Bloomberg) -- Sri Lanka said it is deploying more troops to speed up mine clearing in former conflict zones in the north and allow more than 280,000 mostly Tamil refugees to leave transit camps and return home. “We do not want to take a risk as the government is responsible for ensuring the safety of internally displaced people,” Army Commander Lieutenant General Jagath Jayasuriya said, according to the Defense Ministry’s Web site yesterday. The army will have to recruit between 25,000 and 50,000 new personnel as it has to maintain security in the north after the defeat of the Liberation Tigers of Tamil Eelam in May ended a 26- year civil war, Jayasuriya said. Lankan captain Chathura Maduranga highlights the level of confidence in his team after the stunning 4-3 Nehru Cup win versus Lebanon. Nothing succeeds like success. The power of a victory can be so galvanizing. 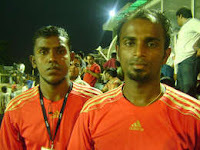 The Sri Lankan football team is a glaring example. Poor cousins to their world champion cricket team, the island’s footballers have suddenly become the talking point in this year’s Nehru Cup tournament in Delhi. While it will be a challenge to hold on to their new status as giant-killers – Lanka clash with top seeds Syria Monday evening – the confidence is palpable. Lankan skipper Chathura Maduranga insists that they are not filling the slots. “We came to play in the finals. We know we are good enough to get there. We didn’t come here for shopping or sightseeing”, he said in an exclusive chat with Mobile ESPN. COLOMBO, Aug 24 (Reuters) - Sri Lanka's shares closed firmer on Monday led by some foreign buying of blue chips and retail speculation on Environmental Resources GREG.CM, Lanka Cement LCEM.CM, and Asian Hotel Properties AHPL.CM. The all-share index .CSE closed 0.3 percent or 7.54 points up at 2,530.46. It closed at a 14-month high on Tuesday. Analysts said foreigners heavily bought John Keells Holdings JKH.CM and Commercial Bank of Ceylon COMB.CM. "Except for fundamental stocks like John Keells, all others were speculative trading," said Nirodha Bohingamuwa, a research analyst at Bartleet Mallory Stockbrokers. Market heavyweight John Keells Holdings rose 0.56 percent to 134.75 rupees, while shares in Commercial Bank of Ceylon closed 1.03 percent up at 147.25 rupees, bourse data showed. Sri Lankan Re-settlement and Disaster Relief Services Minister Rishad Bathiudeen told Parliament on Thursday that the government had re-settled 59,608 war displaced families in Batticaloa, Trincomalee, Ampara in the east and Mannar and Jaffna in the north. As per the figures provided by the Minister, 35,766 families have been re-settled in Batticaloa, 22,068 families in Trincomalee, 669 families in Mannar, 51 families in Ampara and 1,054 families in Jaffna districts., Disaster Management and Human Rights Minister Mahinda Samarasinghe told the House that the goal was the resettlement of IDPs in the areas in which they originally resided. Sri Lanka’s foreign-exchange reserves have exceed $3 billion after more than $ 875 million flowed in during the week from an international hedge fund in the US interested in investing in government Treasury bonds. The 875 million US dollar flow from a "US- based fund" will increase the maturity profile of government debt, said Central Bank Governor, Ajith Nivard Cabraal. The central bank last month raised its 2009 growth forecast to as much as 4.5 percent from an earlier estimate of 2.5 percent, citing increased investments and reconstruction projects. The Central Bank has cut interest rates to a three-year low on easing inflation. The end of the war in May and a $2.6 billion loan approved last month by the International Monetary Fund have boosted investor confidence and increased capital flows into the country.